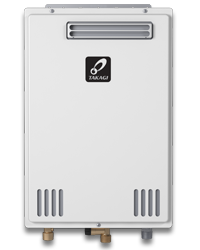 The compact T-K4 is a fully modulating, gas fired, tankless water heater perfect for residential applications. The T-K4 can produce enough hot water for up to three bathrooms in warmer climates. The T-K4 supplies hot water to domestic hot water systems (directly or indirectly) which can be used with storage tanks, recirculation systems, hydronic heating systems, radiant floor systems, and/or domestic & heating applications. The 9007666005 Remote Temperature Controller (TK-RE02) allows the output temperature to be adjusted beyond the factory settings, and works as a diagnostic tool for error codes.